The Waffle House experience. It is a gourmet delight. Waffle House #681. Yemassee, South Carolina. Paul Goldfinger photo.© Blogfinger.net “Ms. Audrey” is on the right. December 16, 2018. Click to enlarge. Our favorite restaurant along US Rt 95 back and forth from Fla is the Waffle House. We like to have breakfast there every day. You can usually find one at most stops along the way. 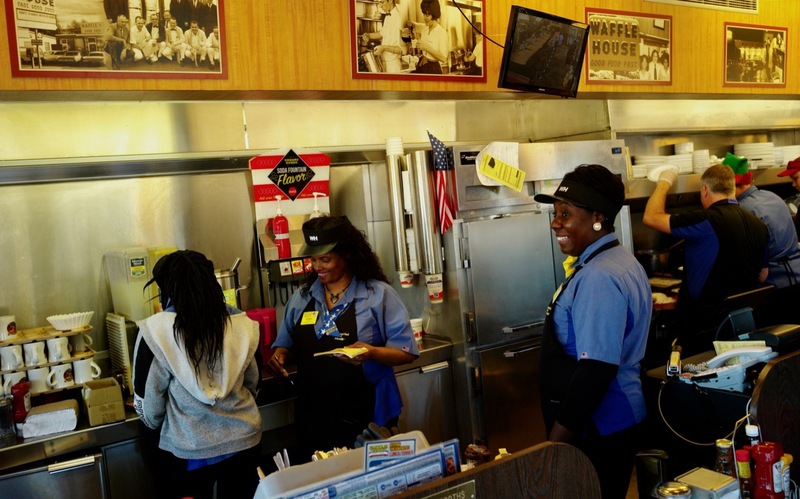 We have written about the Waffle House experience on a few occasions for Blogfinger. Just type in “Waffle House” at the search box, top right corner. This time we decided to stop at WH #681. This is Yemassee, South Carolina. It is right near the highway, so it is easy to get on and off. When we entered, the restaurant was alive with people enjoying their breakfasts, talking, and laughing. Behind the counter, the staff moved like clockwork, calling out orders like “Eggs whale.” We like the fact that these little restaurants are integrated, both behind the counter and in the seats. It’s like that in the South. Waffle Houses are always spotless clean, with everything fresh and delicious. You can watch the cooks prepare the food while the servers bounce around behind the counter, all with smiles and courtesies. Our waitress Ms. Audrey was friendly, happy, and efficient. She encouraged our photography as did Chris, the manager. We had bacon and eggs. I had “hash browns” which is like our New Jersey “home fries,” while Eileen passed on the taters, having tomatoes instead. The bacon was crisp and perfect. We always have their signature raisin bread toast and apple butter. The coffee was fresh made and delicious. When we left, a gentleman held the door for us. He called me “Sir.” And Eileen is “Ma’am.” We had Waffle House breakfasts each day of our journey. And Christmas is in the air, and the Waffle House will be open. In fact they stay open in the worse storms…they are always ready.